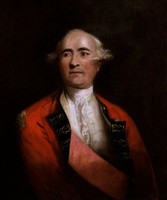 CAMPBELL, JOHN, army officer and Indian agent; b. c. 1731 in Glendaruel (Strathclyde), Scotland; d. 23 June 1795 at Montreal (Que.). John Campbell early embarked on a military career, joining the 43rd (later the 42nd) Foot in 1744. Promoted lieutenant on 16 May 1748, he accompanied his regiment to North America in 1756, and two years later he was wounded in Abercromby’s assault on Fort Carillon (Ticonderoga, N.Y.). 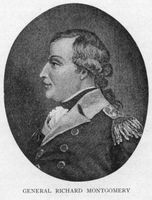 In March 1762 Campbell, now a captain, exchanged into the 27th Foot, with which he served at the siege of Havana, Cuba. From the autumn of 1763 the regiment was stationed at Trois-Rivières (Que. ), and in that year Campbell married Marie-Anne, daughter of Luc de La Corne, who had played an important role in French-Indian relations during the Seven Years’ War. The continuing influence of his father-in-law may have been one of the factors in Campbell’s later appointments in the Indian department. In March 1765 Governor James Murray of Quebec, whose instructions had ordered him to appoint “a proper Person or Persons” to treat with the Indians, named Campbell “Inspector of Indian Affairs.” A jurisdictional dispute developed, however, when Sir William Johnson, superintendent of northern Indians, pointed out that Christian Daniel Claus was already serving as deputy agent to the Canadian Indians. The matter was referred to the British government and Johnson’s claim was apparently upheld, since Campbell was later to petition for the position to which he had been appointed. In late 1766 Campbell was caught up in the Thomas Walker affair when he was accused of being one of the magistrate’s assailants. Imprisoned, he was subsequently freed when charges against most of the accused were dropped. The 27th Foot left Quebec for Ireland in August 1767 and four years later, seeing no chance for advancement, Campbell exchanged to half pay. 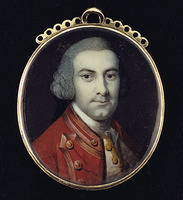 He maintained his interest in obtaining a post in the Indian department, and in September 1772 the Duke of Argyll supported his petition for the superintendency of the Indians in Quebec. Through the influence of Governor Guy Carleton*, Campbell was named superintendent of Indian affairs in Quebec on 3 July 1773. 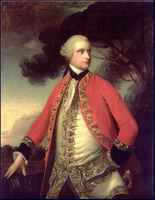 His appointment was part of Carleton’s campaign to reduce the Johnson family’s influence in the department, and Campbell’s arrival at Montreal in September 1775 to claim the superintendency meant the displacement of Claus, who bitterly resented his supersession. 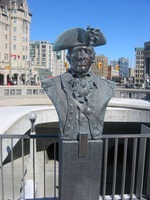 In November Claus joined Guy Johnson, Joseph Brant [Thayendanegea*], and others on a voyage to England, where he hoped to obtain redress from the home government. 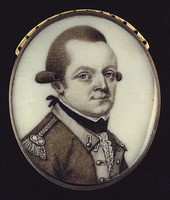 Campbell, who had remained in Montreal, was active in resisting the American invasion, leading a sortie in September which resulted in the capture of Ethan Allen and a part of his force. He was later taken prisoner himself, however, and only in late 1776 was he released and allowed to go to New York. The next year Campbell was given charge of the western Indians on the Burgoyne expedition, although no military duties were attached to the post. According to Burgoyne, neither Campbell nor his deputy Alexander Fraser spoke any Indian language, and this deficiency was partially responsible for their being “of no weight” in Indian councils. 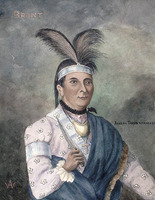 The majority of the Indians left the army in August, and either Campbell accompanied them or he was soon exchanged after the army’s surrender in October 1777 since he was back in Montreal by July 1778. That year, the pressure of the Johnson group combined with Carleton’s replacement by Haldimand, who was more favourable to the Johnsons, led to a resurgence of their interests. Perhaps because of Campbell’s failure to keep the Indians with the Burgoyne expedition and Claus’s fluency in several Iroquoian languages, Claus was appointed deputy agent to the Six Nations in Canada in October, and Campbell’s responsibilities were thereby reduced to some extent. But since Haldimand seems to have been friendly to him and Guy Johnson was preoccupied with difficulties of his own at the time, Campbell was not dismissed as Claus had been. Campbell’s title of “Commandant of the Indians and Superintendent and Inspector of Indian Affairs” made him responsible for all Indians in Canada other than the Six Nations, and because of the largely military character of his work during the revolution he reported directly to Haldimand, although he was expected to inform the Johnson group of his activities. He was ordered to send Indians on scouts and raids into rebel territory, to transmit trade goods and presents to the upper posts, and to supply and provision Indians on government service. In addition, he took part in government councils with the Indians, especially during the later phase of the revolution when some of the Six Nations were preparing to enter Canada. Campbell seems to have worked well with Haldimand, although like other officials of the department he incurred the governor’s criticism for its large expenses. In late 1782 Sir John Johnson* was appointed superintendent general of Indian affairs, whereupon Campbell became responsible to him. Problems about an exact definition of Campbell’s position led to difficulties on occasion. As early as spring 1774 he petitioned for the rank of lieutenant-colonel in the army, and he repeated this request on several occasions. 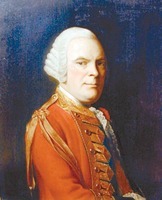 Twice in 1779 he also claimed the command of the Montreal garrison in the absence of the senior military officer. Haldimand adamantly refused all the requests made during his governorship, and he was supported by the British government. 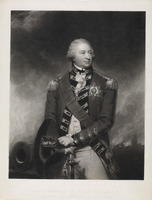 From the correspondence over the matter, it appears that Campbell’s titles of major (which he had received in 1773) and lieutenant-colonel (1777) were courtesies only since his position was a civil one. Thus although the Army list mentioned him as having local rank in America, he was allowed neither the rank nor the pay of an officer. With the end of the war Campbell’s courtesy rank of colonel, awarded him in 1782, was taken away, and he reverted to lieutenant-colonel. He petitioned the British government for reinstatement as colonel, but it was not until 1790 that this advancement occurred. In 1792 he again attempted to assert his authority when he claimed the command of the department in Sir John Johnson’s absence. 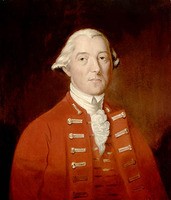 Lieutenant Governor Alured Clarke* was no more helpful than Haldimand: he replied that Campbell’s appointment was confined to Lower Canada and gave him no claim to command the entire department. Campbell’s frustration at not having his Indian department service recognized in a suitable military fashion was at the centre of the department’s ambiguous position in government; not until 1830 was its status finally determined. Campbell seems to have dealt with departmental business in a responsible way but on at least one occasion his normal routine was interrupted by the displeasure of Lord Dorchester [Carleton]. During the early 1790s a sensitive situation developed as the British government became involved in the dispute between the Americans and Indians over the Ohio country. When one of Dorchester’s speeches to an Indian council appeared in the American press early in 1794, he ordered Campbell to discover how the speech had been obtained and accused the Indian department of Lower Canada of being in a “deranged state.” Campbell reported that he did not know how the speech had been acquired and evaded the second issue by attempting to explain instead the “deranged state” of Lower Canada’s Indians. One year later his career was ended by his death. It is difficult to assess Campbell’s career. Some authorities have seen him as a grasping incompetent, an 18th-century version of the later American carpetbagger. But this assessment is probably unjust; his difficulties were as much the product of Indian department upheavals during the revolution as they were of his own shortcomings. BL, Add. mss 21771–73; 21873, ff.146–47v; 21882, f.10. PAC, MG 19, F1, 23; MG 23, Al, ser.1, 8, ff.2285, 2287. Johnson papers (Sullivan et al. ), VIII, 1103, 1109; XII, 114, 691, 698. PAC Report, 1888, note A. “State papers,” PAC Report, 1891, 27, 65–66, 105. “State papers – Lower Canada,” PAC Report, 1890, 76, 89, 111, 112. Quebec Gazette, 2 July 1795, 18 March 1813. G.B., WO, Army list, 1758–95. PAC, Preliminary inventory, Record Group 10: Indian affairs (Ottawa, 1951), iii. Graymont, Iroquois, 81, 148, 150–55, 175. R. S. Allen, “The British Indian department and the frontier in North America, 1755–1830,” Canadian Historic Sites: Occasional Papers in Archaeology and History (Ottawa), no. 14 (1975), 5–125. Douglas Leighton, “CAMPBELL, JOHN (1721-95),” in Dictionary of Canadian Biography, vol. 4, University of Toronto/Université Laval, 2003–, accessed April 20, 2019, http://www.biographi.ca/en/bio/campbell_john_1731_95_4E.html.